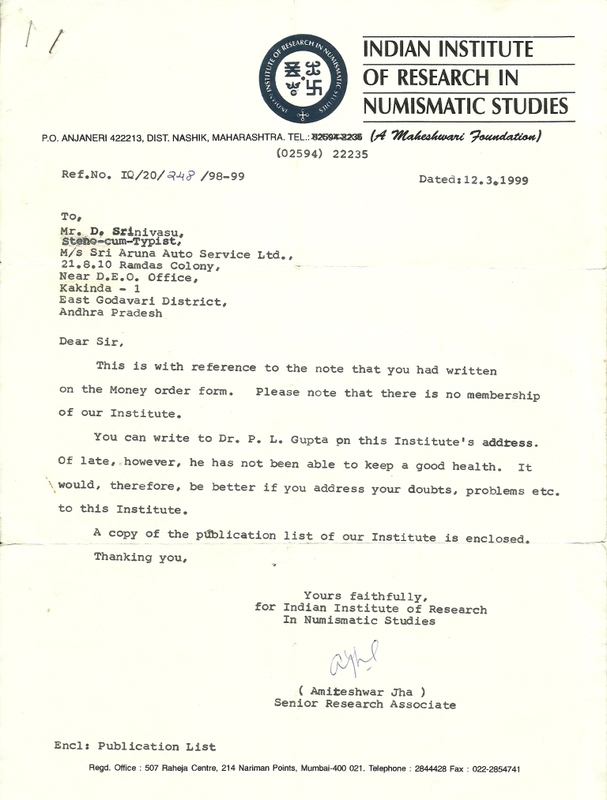 In the year 1999 I wrote letter to Indian Institute of Research In Numismatic Studies, Anjaneri, Near Nasik which devoted for study on Ancient Indian Coins by enquiring about Dr.Parameshwar Lal Gupta by sending Money Order to the Institute. 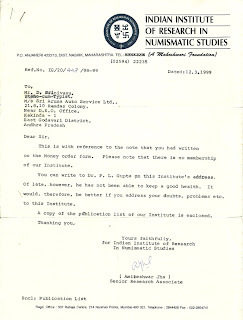 In reply to me they sent a letter on Institute Letterhead and they informed that Dr.Parameshwar Lal Gupta is not well at that time due to his old age. After that in the couple of days later i went to Shiridi alongwith my family members. At that time i went to Anjaneri to visit the Institute. I spent some time in the Institute Museum, Library and met some scholars and showed the letter which i received from their Institute. At that time i expressed my desire to meet Dr.Parameshwar Lal Gupta personally and accordingly they arranged a meeting of mine with Dr.P.L.Gupta who is 94 years old at that time. I met Dr.Gupta in his rest house and talk several things on ancient indian coins, their script etc. Dr.P.L.Gupta was very much impressed and asked me "What i can do for you young man?". Then i requested him as "Sir i want your personal autograph letter to me". Accordingly Dr.Parameshwar Lal Gupta gave his autograph letter to me on Institute letterhead with his shivering fingers due to his old age. 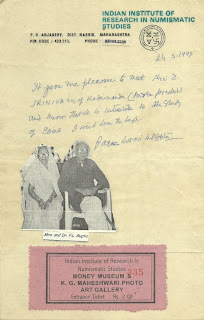 These are "Indian Institute of Research In Numismatic Studies, Anjaneri" letter to me and Dr.Parameshwar Lal Gupta autograph letter to me on Institute Letterhead. Dr. PARMESHWARI LAL GUPTA was a distinguished numismatist, with international recognition. And, this besides, an educationist, a social reformer, a journalist, a museologist, a literature, and a tireless researcher-all rolled into one: into his one versatile personality. Also an Honorary Fellow of Numismatic society of India (Elected 1974), Honorary Member of International Numismatic Commission (elected 1986), and Honorary Fellow of Royal Numismatic society, London (elected 1975), Royal Asiastic society of Great Britain, and Asiatic Society of Bombay (both elected in 1993), he had chaired History / Archaeology / Fine Arts / Numismatics sections of Various national and international conferences. Dr Gupta was a prolific writer too, credited with the authorship of over 30 books and 250 research papers on diverse themes from his several specialized disciplines. Among his other achievements, he was the recipient of many prestigious awards / honours, including Huntington Medal, Lhotka memorial prize, Royal Numismatic Society’s Medal, and Sir J Sarkar Gold Medal.